Zephyr's AK1100S's 30-In. 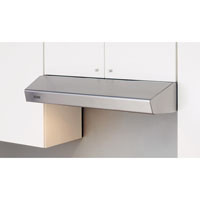 Essential Series Breeze I Under-Cabinet Range Hood, in stainless steel, sophisticated features and performance set the industry value standard. Its three-speed, 250 CFM blowers quietly clear the air while convenient dishwasher-safe aluminum filters efficiently remove airborne residues. Sleek, integrated controls simplify cleanup, and the two-level halogen light bulbs let you set a low-key mood when the time is right. Zephyr's AK1100W's 30-In. Essential Series Breeze I Under-Cabinet Range Hood, in white, sophisticated features and performance set the industry value standard. Its three-speed, 250 CFM blowers quietly clear the air while convenient dishwasher-safe aluminum filters efficiently remove airborne residues. Sleek, integrated controls simplify cleanup, and the two-level halogen light bulbs let you set a low-key mood when the time is right. The Zephyr AK1124W Essential Series Breeze I Under-Cabinet Range Hood, in white, has sophisticated features, and it's performance has set the industry value standard. Its three-speed, 250 CFM blowers quietly clear the air while convenient dishwasher-safe aluminum filters efficiently remove airborne residues. Sleek, integrated controls simplify cleanup, and the two-level halogen light bulbs let you set a low-key mood when the time is right. The Zephyr AK1136B 36-In. 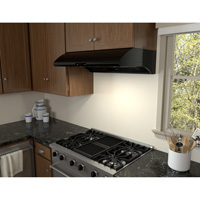 Essential Series Breeze I Under-Cabinet Range Hood, in black, has sophisticated features, and its performance set the industry value standard. Its three-speed, 250 CFM blowers quietly clear the air while convenient dishwasher-safe aluminum filters efficiently remove airborne residues. Sleek, integrated controls simplify cleanup, and the two-level halogen light bulbs let you set a low-key mood when the time is right. The Zephyr AK1136W 36-In. Essential Series Breeze I Under-Cabinet Range Hood, in white, has sophisticated features, and its performance set the industry value standard. Its three-speed, 250 CFM blowers quietly clear the air while convenient dishwasher-safe aluminum filters efficiently remove airborne residues. Sleek, integrated controls simplify cleanup, and the two-level halogen light bulbs let you set a low-key mood when the time is right. The Zephyr AK1200B 36-In. Essential Series Breeze II Under-Cabinet Range Hood, in black, comes equipped with upgraded three-speed, 400 CFM blowers, convenient dishwasher-safe aluminum filters and a timed delay-off feature to automatically clear the air and power down after five minutes. Sleek, integrated controls simplify cleanup, and the two-level halogen bulbs let you set a low-key mood when the time is right.